It would be hard not to notice a supremely stylish pup strutting down snow-blanketed streets in a faux-fur coat. Especially if the coat is made by a charitable-minded industry leader like Rhode Island-based Up Country, Inc. Working with wonderful animal-welfare organizations — from local to national and international causes — such as Dogs on Deployment, David Sheldrick Wildlife Trust, Waterman St. Dog Park, and Rhode Island Society for the Prevention of Cruelty to Animals (RISPCA), Up Country is able to donate much-needed funds in addition to hundreds of collars and leashes for dogs and cats who truly need them. What’s more, the pet gear company recently launched “Adoption Tails” on Facebook and Instagram so animal lovers can share their amazing stories of giving a furry friend a forever home. So outfitting your pup in a chic coat like the gold or silver Aspen Puffer ($44-$49) when the cold weather hits means you’re supporting a business that does some good in the world. And you also get the benefit of a fashionable and functional coat for your pooch. 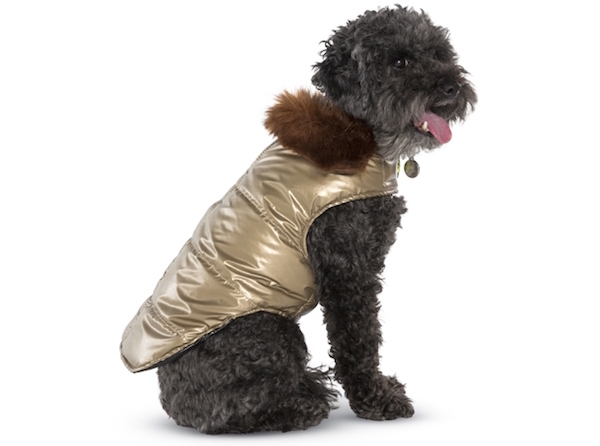 The metallic shell, faux-fur collar, and quilted lining are machine washable, and it all comes with a harness patch and Velcro closures. To learn more about Up Country’s “Adoption Tails,” check out instagram.com/adoptiontails. The post Keep Your Dog Warm With This Chic Coat From Up Country appeared first on Dogster.